Great news for our Seattle fans! The Emerald City's newest farmer's market, the Terry Avenue Saturday Market, which is located on Terry Avenue (duh) in the South Lake Union Neighborhood, will soon become the FIRST FARMERS MARKET IN SEATTLE TO CARRY KOMBUCHA TOWN! Photo via Terry Avenue Saturday Market on Facebook. The market's opening date is THIS Saturday, June 6, and it runs from 10 a.m. to 3 p.m. every weekend through Saturday, October 3, at 225 Terry Ave North. You can find more information on their Facebook page, where they've been posting a TON of news and photos ahead of the big opening day. Make sure to stop by the Kombucha Town booth and grab a $3 can of our flavored kombucha in cans: Blueberry White, Green Jasmine, Guayusa Mint, and Gold Light. Mention this blog post and receive $1 off your first can! 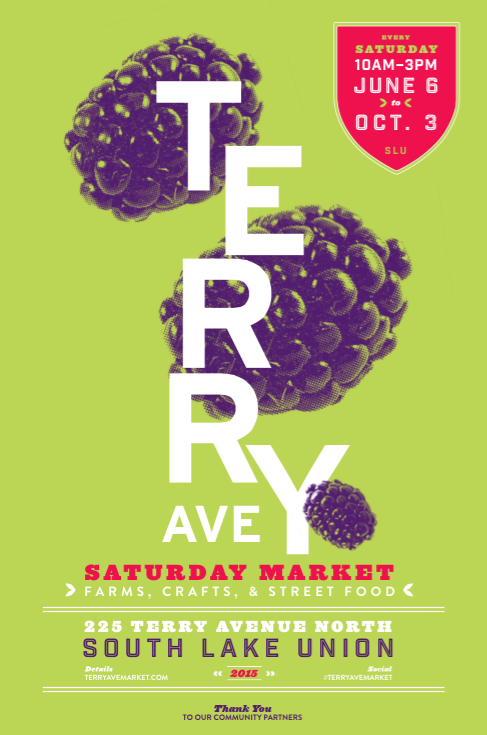 The Terry Avenue Saturday Market will feature over 65 local farms, businesses, homemade crafts and street food. Check our their cute posters below, and be sure to head over to their Facebook page for a glimpse of some of the amazing vendors and tasty foods that will be at your fingertips this summer.